Are the subjects of Asch’s experiments conformists? There is a handful of psychology works that have the burdensome honour of informing our view of human behaviour, usually with spectacular results that tend to satisfy some of our preconceptions on how this behaviour should look like. Two of them, the Stanford prison experiment (showing that stable adults quickly become sadist prison guards, given the right situational cues) and the Milgram experiment (showing that stable adults are willing to obey to an authority, in this case the experimenter, to the point of administering painful electric shocks to unknown confederates of the experimenter), while retaining fascination in the large public, tend to be considered cautiously by scientists, and have been recently criticised in mainstream or quasi-mainstream media (see, for example, here, here, and here). highlighted the fragility of the person in a mass society when he is confronted with the contrary opinion of a majority, and the tendency to conform even if this means to go against the person’s basic perceptions. This is a chilling text that should be carefully read and remembered whenever we think we are swayed by the mass, against our deepest feelings and convictions. Going back to Asch, I found again an unproblematized reference to the experiments in my flight reading of yesterday, topped with a bonus of a recent fMRI experiment showing that the brain area activated during the wrong response of the subjects was linked to spatial awareness, not to conscious decision making (i.e. “subjects were calling it like they saw it” – insert sarcastic face). So here is a post to try to make some clarity. Unfortunately, in this case, the scientific definition is as precise as the one we use in the common language, that is: not at all. This is a pity, because a quantitative and appropriate (at least for some usages) definition of conformism has been developed in the field of cultural evolution more than thirty years ago. In Culture and the Evolutionary Process, Robert Boyd and Pete Richerson define conformist frequency-dependent bias as requiring “naive individuals be disproportionally likely to acquire the more (or less) common variant” (pag. 206, italics in the original). The critical point here is obviously the “disproportionally” part. Imagine you enter in a Caffè, and, on 10 clients, 7 are drinking wine, and 3 coffee (I just travelled in the south of France). A conformist bias does not simply require that you will be more likely to drink wine, but that your probability to drink wine will be higher than 70%. Why is this important? As Boyd and Richerson note, “almost any time there is cultural transmission” (ibidem) you will be more likely to drink wine. In fact, if you choose absolutely randomly, you will have exactly the 70% of probability of choosing wine (imagine you are blindfolded and touch a client to decide what to order – do not do this in the south of France). So, conformism, if we use this precise definition, is not “do what the majority does”, because for “doing what the majority does” one does not need any bias, but simply copying at random. When individuals are conformists, one can visualise the relationship between the frequency of a certain behaviour (say the wine drinking in the Caffè) and the probability to perform that behaviour (say to actually order wine) with a sigmoid line (see the red line in the graph above). The dotted black line is unbiased or random copying. Now we can go back to Asch. In the classic set-up (see the various descriptions in Asch 1955), a subject is supposedly participating in an experiment involving a simple perceptual task. 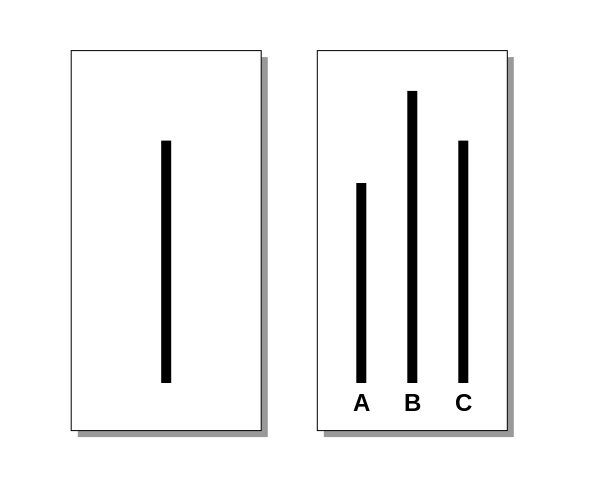 She is shown a card with a line (see figure below, left) and is then asked to match the line of the same length in a second card (see figure below, right). The twist is that there are other seven participants to the experiment and they are, unknowingly to the subject, instructed by the experimenter on how to respond to the test. Because of the way they are positioned in the room, the subject is always the last one to answer and can listen to what the others say. The confederates give the “true” answer for the first two trials, and then they start to give wrong, unanimous, answers for 12 of the 16 remaining trails, on which the subjects’ answers are actually tested. What are the actual, not so chilling in fact, results? 25% of the subjects never defied to the majority opinion, and kept on, for all trials, to give the “correct” answer, impermeable to any social influence, while 5% of the subjects always gave the answer of the confederates. Over all subjects, and all trials, 36.8% of answers were influenced by the majority opinion. In a variation of the experiment, interesting from our perspective, Asch replaced a confederate with a “true” participant (or instructed a confederate, this time, to give the correct answer) and found that “subjects answered incorrectly only one fourth as often as under the pressure of a unanimous majority” (Asch 1955), that is, slightly less than one in ten times. What if we look at these results from the point of view of Boyd and Richerson’s definition of conformism? The plot below uses the same logic of the first one (i.e. 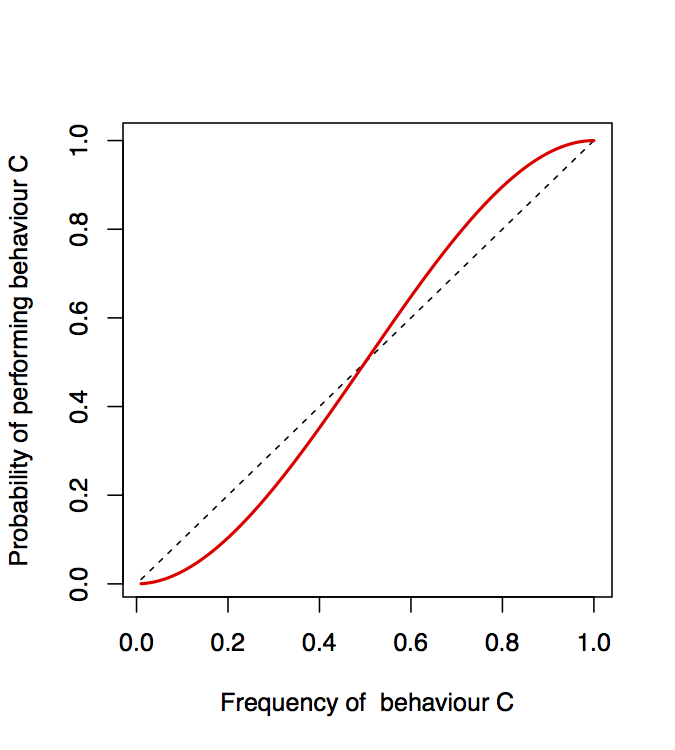 plotting the frequency of a behaviour versus the probability of performing it) using the data from Asch’s experiments. 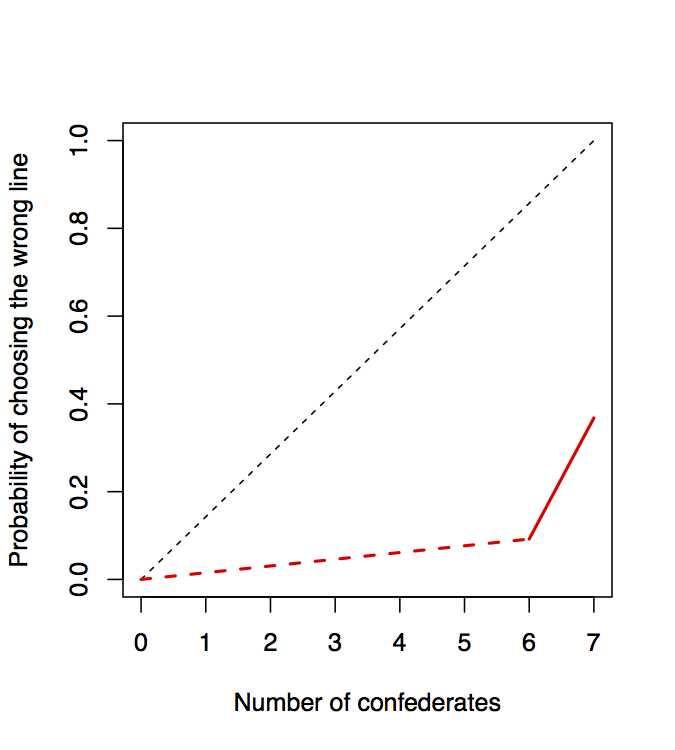 In the classic experiment, where all the seven confederates chose the wrong line, “only” 36.8% of the times subjects did the same, and, when 6 confederates chose the wrong line, only ~10% of the times. The red trend is then dotted as we do not have data, but the only alternative I can imagine is that the probability would drop to zero even sooner. One needs to conclude not only that subjects in the Asch experiment were not conformist, but they were not even particularly socially influenced (remember the dotted black trend represents unbiased, random, copying). And here a xkcd, just because is the 10th of August. Update 11.08.2015. Alex Mesoudi pointed me to Efferson et al. 2008, Evolution and Human Behavior (pdf here), see in particular section 3.3. They reach (ehm…7 years before me) similar conclusions, but discuss that “the joint effect of conflicting biases means that we cannot isolate the response to frequency information” and so, if I understand correctly, that we can not claim neither conformity nor absence of it for Asch’s results. This sounds sensible to me, but is there any real empirical data where we actually can isolate the response to frequency information? Cultural attraction, “standard” cultural evolution, and language. I fully share your irritation with the vogue of the conformity concept… but I don’t really agree with your last sentence: « … not only that subjects in the Asch experiment were not conformist, *but they were not even particularly socially influenced* ». Random copying is not the relevant baseline. What others think is simply irrelevant, when the subject has the answer under her eyes. The relevant baseline was, of course, Asch’s control condition, where subjects were alone, and made no mistake whatsoever. Any departure from the truth, in the task, constitutes a non-trivial form of social influence. Now, I would be the first to argue that this can be due to many factors, and that simplistic interpretations thrive. (Including, dare I say it, in our field of cultural evolution.) My favorite take on Asch is Baron et al.’s 1996 replication, where they introduce rewards. But I would not say Asch did not demonstrate any social influence—and I would not fetishise Boyd & Richerson’s definition of conformity as the One True Definition. I am not sure it has ever been shown to correspond with anything real. My view, for waht it’s worth, is that social influence really happens, but is due to a hodgepodge of psychological factors that do not amount to a hardwired instinct to follow the herd whatever the costs. thank you for your comment: very reasonable, as usual. I agree with you that Asch’s results show social influence. Let’s say that I got carried away to finish the post with a bang – and good that the blogs comment system allows to clarify! However (of course this was coming…), let me expand on my inclination to consider random copying as a useful baseline, at least on a quite abstract level: I imagine that, in many empirical cases, one can not isolate a situation in which social influence is ruled out, like in Asch’s control condition, and has only data on the frequency of some behaviours. Going back to my Caffè example, I might not know the preferences of the individuals, but I can check whether they choose coffee or wine in respect to what the other customers are drinking. In this case, I think that the plot frequency of C / probability of performing C would be a useful tool, and my baseline expectation would be in fact random copying (I think this could be extended to many cases). If I would find a result similar to Asch’s, I would then start to wonder whether something is going on, and now I would be interested to know what people would have done if they were alone (i.e. the baseline you prefer). Perhaps my subjects were a group of alcoholics, and I might be surprised that almost a quarter of them restrained to drink wine because of social influence! But maybe not, in which case it would be fair to conclude that social influence was not strong (everybody was drinking coffee, and still the majority of people ordered wine!). So, yes, you are right that the relevant baseline in Asch’s case is the virtual absence of mistakes in the control condition, but if ones does not have this information it is useful to look in the plot and see where the data cluster, with them being far from the diagonal signalling more importance of the individual VS social component. Perhaps I may say that in the Asch case the individual component is in fact more important than the social one (which is obvious, because we “see” which line is the correct one). Allow me another paragraph on the “One True Definition”: I think Boyd and Richerson captured an important population-level property. If we do not impose the “sigmoid” constraint, any form of social influence is *conformism*, and so it is not clear to me any more why to use this term. At the same time, I agree with you that it is difficult to be sure whether “it has ever been shown to correspond with anything real”. This means two things for me. One question is whether we can ever see in real data the signature of the sigmoid curve. This is an empirical question, and, well, if it happens that this is extremely rare, than problem solved! (What do you think? Alex just suggested to me, for example, this paper: http://xcelab.net/rmpubs/efferson%20et%20al%20EHB%202008.pdf). Another is: even when we see the sigmoid, what is the individual mechanism producing it? I do not find realistic the idea that individuals “copy disproportionately” as they need to (1) evaluate the frequency of a behaviour and (2) “add” some probability, etc. I am working on this last question! Nice post! I’m not going to take issue too much with the Asch results, but am just popping in with a few references. Claidière and Whiten (2012) have helpfully called the kind of conformity bias put forward by Boyd and Richerson (1985. Also, Henrich 2004) ‘hyperconformity bias’. I think this is a useful term that characterises the way in which, as they say: “the probability that an individual displays the behavior most frequent in the population is greater than the frequency of that behavior in the population” (p. 139) Claidière and Whiten (2012) also make some speculations about the kind of scenarios in which hyperconformity bias is likely to occur (with strong normative pressure), which is I think could be subject to further scrutiny. I think their conclusions about uncertainty require further analysis, in particular. I also want to say that Tim Lewen’s forthcoming book (or maybe it’s out by now?) on cultural evolution has a sustained critique of the conformist learning literature, one that leans heavily on worries about the mechanisms underpinning conformist bias. Might be worth a look. thank you for your input. I know the conformism papers from Claidière and Whiten, but I am perhaps less positive on their “hyperconformity” definition. I think I understand they proposed this terminology to be able to include in the definition of conformism the classic results from social psychology (as Asch’s ones), which would be excluded according to the Boyd and Richerson definition. However, in this way, they have to define things like “linear conformism” or “weak conformism” (which would be anti-conformism according to B&R!). This not only create confusion, but it seems to me also conceptually inaccurate. “Linear conformism”, for example, is, as I discuss in the post, random copying, so you do not need any bias at all to produce this effect! My impression is that, as in some other social psychology and animal behaviour works, “conformism” is somehow equate to generic social influence. I think this is not a good way to use the term. Regarding Tim Lewen’s book: I actually ordered it yesterday and I am very looking forward to start to read it! I absolutely agree (if this is what you are referring to…) that in the conformist learning literature there is confusion between levels, with sometime conformism linked to mechanisms, and sometimes to population outcomes (like B&R definition). As I quickly mentioned in my answer to Olivier’s comment, I am doing some modelling work about this exact topic, and I hope to have soon something more to say!